I’ve been wanting to try a vegan pudding recipe for ages, but replacing eggs is always challenging to say the least. Lately, I have been playing around with a variety of egg replacers and have had great success using a new flax mixture. 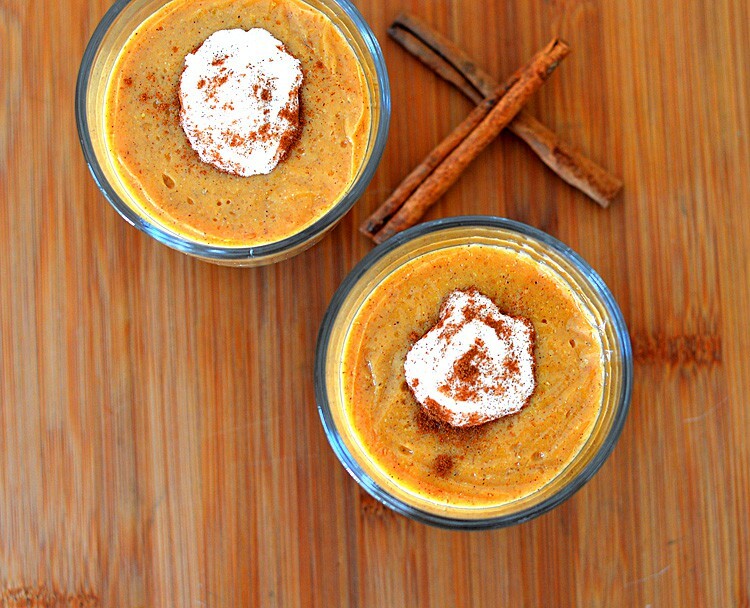 I am really happy with how this Pumpkin Pie Pudding turned out! 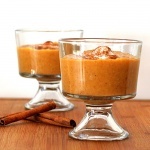 It has just the right amount of sweetness, that pumpkin-y flavor with the traditional mix of spices. This pudding should be made one day ahead for best results. Top with our recipe for Coconut Milk Whipped Cream and a sprinkle of ground cinnamon (candied pecans would be nice as well). In my notes, you’ll see that I make a recommendation regarding the flax mixture. When refrigerated, the ground flax + water reached a very gelatinous consistency (which closely resembles what an egg would have provided to this recipe). It does set up slightly thicker, so you can always reduce the flax to 1 Tbl keeping the 3 Tbl of water the same. This will give a little looser consistency to the finished pudding. It really comes down to personal preference. You’ll want to cover the warm pudding with plastic wrap as shown so that the pudding doesn’t form a skin. It removes very cleanly and easily. 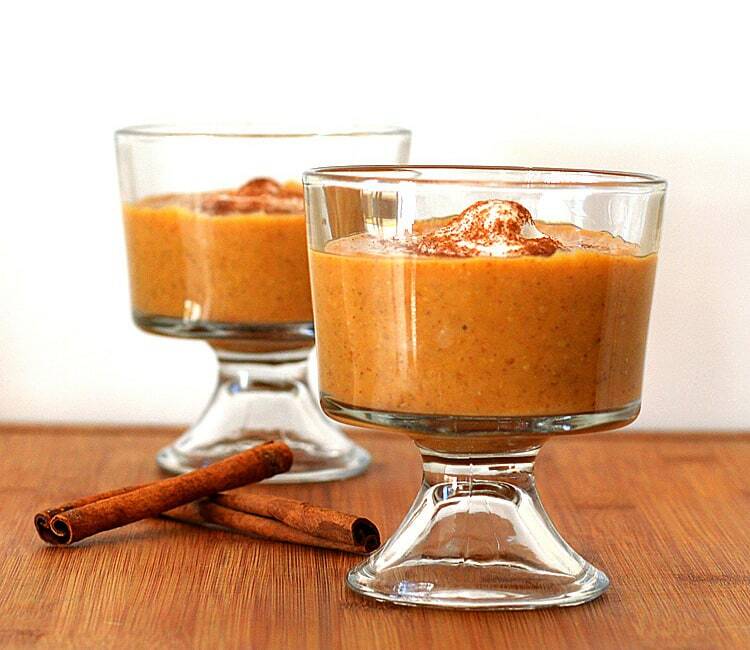 We topped the pudding with our Coconut Milk Whipped Cream and ground cinnamon. You could get creative with your toppings. 2 in Tbl Ground Flax + 3 Tbl Water allowed to sit the refrigerator for about 15 minutes. NOTE: If you like a looser pudding keep the water the same, but reduce the flax to 1 Tbl. Begin by preparing your flax mixture. NOTE: If you prefer a thicker, more gelatinous pudding, use the 2 Tbl of ground flax + 3 Tbl Water....for a looser pudding, use 1 Tbl of ground flax + 3 Tbl Water. In a small bowl, combine the pumpkin, vanilla, salt and spices. Set aside. In a medium saucepan over medium heat, add the sugar and cornstarch. Whisk together the almond milk and prepared flax mixture, adding to the pan. Stir constantly, bringing to a boil. Cook for 1 minute once boiling and remove from heat. Add pumpkin mixture to the pan and combine. Over low heat, whisking constantly, cook for 3 minutes. 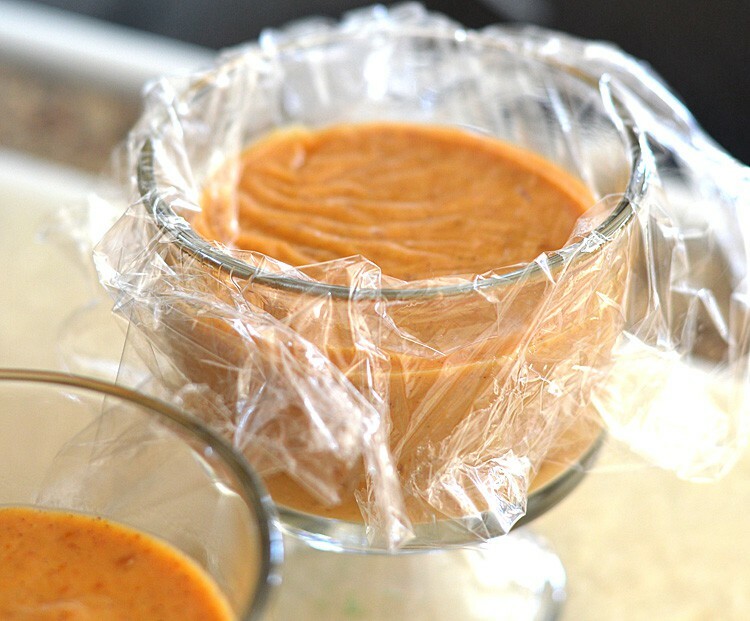 Cover with plastic wrap directly on the pudding while warm. This will prevent a "skin" from forming. Allow to chill for several hours, preferably overnight. Serve with our Coconut Whipped Cream and a sprinkle of cinnamon. Does the flax give it a nutty flavor? Or does it get hidden with the pumpkin? This sounds great! Could definitely replace pumpkin pie with this! I bet the coconut milk gives a delicious flavor to the pudding. Your pictures are very appealing, I can’t wait to give this a try!